After drenching the Mid Atlantic region for most of the week, the remnants of Tropical Storm Lee have finally let up their relentlessly rainy reign. Although some flash flood warnings and watches as well as river flood warnings remain in effect, the heaviest rainfall has ended, leaving behind some record-breaking accumulations. Double-digit storm totals have been recorded across at least 10 states from Louisiana to New York. 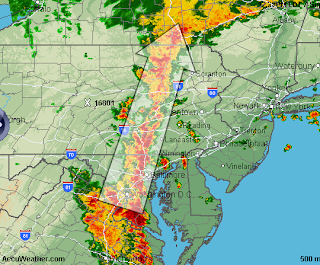 The highest amount appears to be 20.96" at a cooperative station near Colonial Beach, VA, but a plume of very heavy rainfall extended northward through the Susquehanna River watershed of Pennsylvania and New York. 6 PM Update: As of 5 pm, an additional 1.41" of rain has fallen at Binghamton today, bringing the monthly total to 10.08" and the yearly total to 51.27". After slightly more than a week, this month's total is now the second highest all-time amount, behind the 11.45" in June 2006. After setting an all-time daily precipitation record just last September, Binghamton, New York has smashed that record by a wide margin with 7.49" yesterday (Sept. 7). Since the previous record was set in 2006, the 3 highest daily rainfall amounts at Binghamton have now occurred within the last 5 years. Climate records began in 1951 at the current airport location, but climate data in the city extend back to 1890. The record rainfall for any 24-hour period at the previous location was 4.55" in Sept. 1924. The year-to-date total rainfall is also a new all-time annual record. 0.80 INCHES SET IN 1996. THIS CALENDAR DAY RAINFALL ALSO SHATTERS THE RECORD FOR ANY DAY. THE OLD RECORD WAS 4.24 INCHES ON SEPTEMBER 30TH IN 2010. PRECIPITATION FOR THE YEAR NOW TOTALS 49.86 INCHES AS OF MIDNIGHT. THIS BREAKS THE OLD RECORD FOR ANY YEAR OF 49.78 INCHES SET IN 2006. THIS SHOULD BREAK THE RECORD BY MANY INCHES. 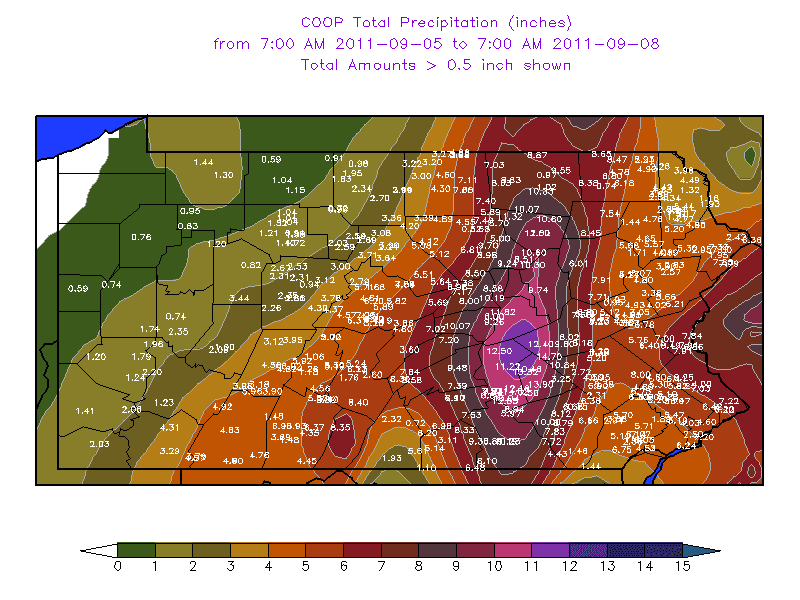 Sept. 8, 4 PM Update: Added storm rainfall map. 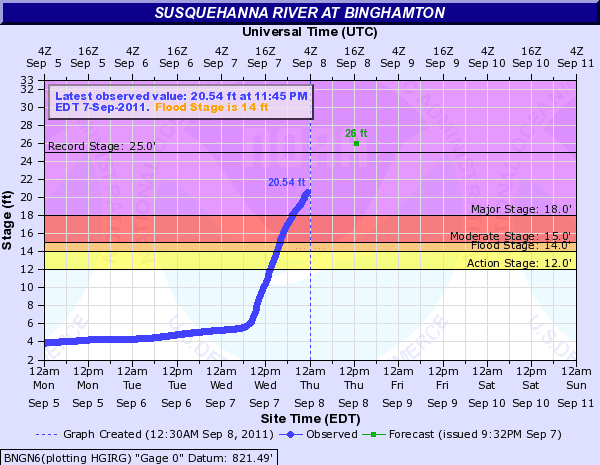 Sept. 8, 2 PM Update: As of 2 pm, the river stage of 25.6 ft at Binghamton is above the old record. 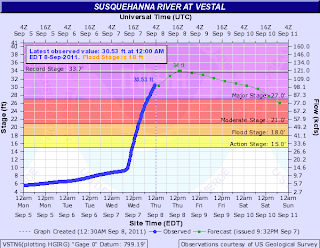 The current forecast crest is 26.2 ft.
Vestal is at 35.3 ft, which is over 1 foot above the old record, and the forecast crest is 36.9 ft. 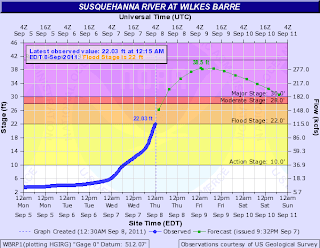 The new forecast crest of 40.7 feet at Wilkes Barre is just 0.2 ft below the all-time record from storm Agnes in 1972. The record daily rainfall at Harrisburg on Wednesday was part of extremely heavy precipitation throughout the Susquehanna River watershed. 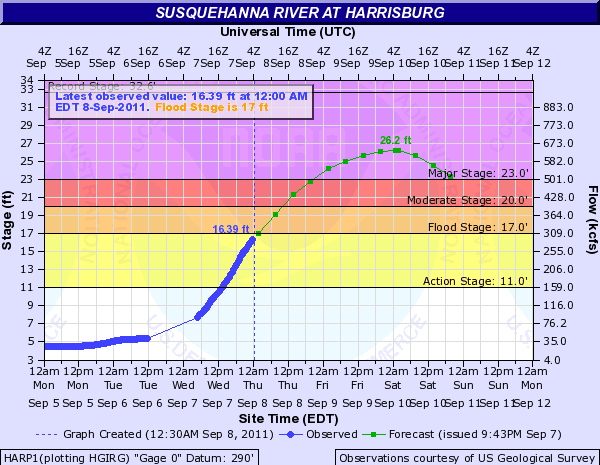 As of midnight, the river depth of 16.4 ft. at Harrisburg was just below the flood stage of 17 feet. 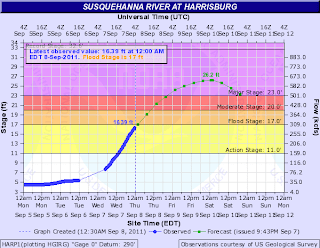 The crest of 26.2 feet predicted for Saturday would be the 4th highest on record at Harrisburg. Upstream, the forecast 38.5 feet at Wilkes Barre would be the 2nd highest on record. 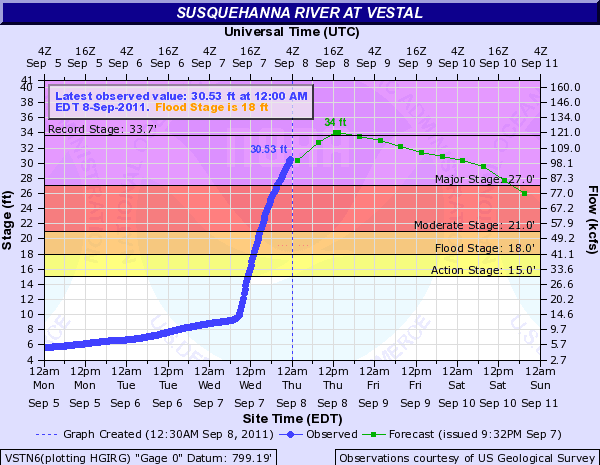 At Vestal, New York, the current 30.5 feet is well above major flood stage, and the forecast of 34 feet would be an all-time record. 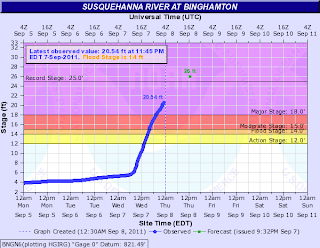 The current 20.5 feet at Binghamton is also at major flood stage, and the forecast 26 feet early Thursday afternoon would beat the all time record of 25 feet on June 28, 2006. Sept. 8, 2 PM Update: The final Harrisburg daily rainfall total for Sept. 7 is 7.71". The 2-day total is 9.73". The storm total since Sunday evening is 13.30" as of 9 am today. Sept. 8, 1 AM Update: Heavy rain has continued through midnight at Harrisburg, with 2.08" just in the hour ending at 1 am EDT (midnight standard time). That puts the daily total at the 2nd highest of all time. Downpours from the remnants of Tropical Storm Lee have been producing record rainfall amounts in the Mid Atlantic area. 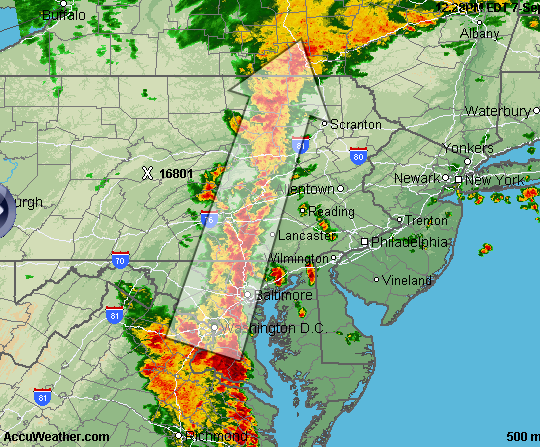 The National Weather Service reports that the 5.05" of precipitation as of 5 pm today at Harrisburg, Pennsylvania has already smashed the old daily record of 1.18" set in 1998. Unofficially, this is also an all-time daily record for September, beating the 4.59" on Sept. 26, 1975. The top two all-time daily rainfall records at Harrisburg were set on June 21 and 22, 1972 from the remnants of Hurricane Agnes. Today's amount is now the 3rd highest all-time amount. The 2-day total on Sept. 25-26, 1975 was 8.87". Together with the 2.02" yesterday, the current 2-day total is 7.07". Climate records began at Harrisburg in 1888. After lagging somewhat in August, the current Arctic total sea ice extent has caught up with the record low area of early September 2007. This puts it very close to the all-time record low at the 2007 seasonal minimum. The average ice extent for last month was the second lowest for August, behind only 2007. The chart (click to enlarge) from the National Snow and Ice Data Center (NSIDC) shows data through Sept. 5. Arctic sea ice extent averaged for August 2011 reached the second lowest level for the month in the 1979 to 2011 satellite record, and has now fallen below the minimum daily extents in 2010 and 2008, previously the third- and second-lowest Arctic sea ice extents in the satellite record. Talk to the Invisible Hand: "On Climate Change, the Market Has Spoken"
Politicians have been known to dissemble about risk because voters don’t generally like to hear bad news. The insurance industry makes its money telling it to you straight—how long you’ll likely live, what price your home will fetch, whether to repair or trade in your car. For this reason it’s worth noting that insurers already factor climate change into their models for measuring, pricing, and distributing risk. Insurers have no incentive to lie. If they are more scared than they should be in pricing risk, shareholders will punish them. If they aren’t scared enough, nature will do the job. Follow the link to see the full text.